Magdubo98, I don't know which site you are actually a member of (I am just another customer/fan of the CuteEmbroidery group of sites), but cutealphabets.com (the site you are currently posting on) is NOT a subscription site. All the alphabets here are on a single-purchase basis. Cuteembroidery.com IS a subscription site, so you can purchase a membership and download any and all designs you want during the time you have paid for. Although the names are similar (and they are in fact owned by the same parent company) they are NOT the same site. 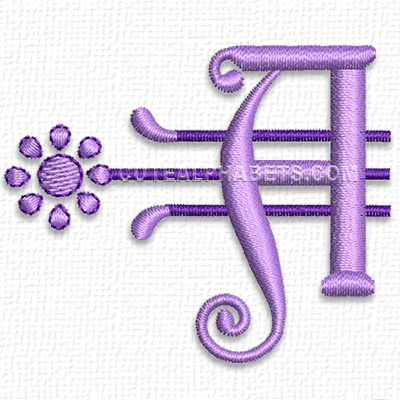 Your membership for CuteEmbroidery does not cover the alphabets here on cutealphabets.com. This is not a membership website. There are 2 cute websites. your membership is for the other one. As a member I should be able to download patterns.. No one is monitoring this site , you have taken my money and are not allowing me to download.. Someone help please or return my money. Nice for gifts for my musical friends for Christmas. This font is so beautiful! This is such a beautiful font.